“The Supreme Court begins its new term [October 1] as bitterly divided as it has ever been. There are three hardened camps: four very conservative justices, four liberals, and a moderate conservative, Justice Anthony Kennedy, hovering in between. The division into rigid blocs is unfortunate, because it makes the court seem more like a political body than a legal one. Justice Kennedy’s tendency to vote with the most conservative justices also means that there is a real danger the court will do serious damage to important freedoms this term.” So begins The New York Times’ editorial in Sunday’s edition. The fear of the Court rendering rulings that are (shudder) conservative is palpable. What worse fate could befall the union, except maybe that somehow George Bush will find a way to remain President beyond January 20, 2009? What The Times doesn’t understand or isn’t willing to say is that the conservatives—whom the editorial terms “very” conservative—aren’t “political conservatives,” they are “judicial conservatives,” and the liberals—whom The Times terms only “liberal”—aren’t “political liberals,” they are “judicial liberals,” and Justice Kennedy can’t decide which type of jurist he is and consequently bounces back and forth. A “judicial conservative” is someone who reads the U.S. Constitution literally, a “strict constructionist,” one who thinks the Founders and the Framers meant what they said in the plain language that they used in the founding documents, the “original intent” of those documents. A “judicial liberal” is someone who believes that the Constitution is a “living” document, the plain language of which changes with the wind and the whims of The Times. Nothing could be worse for The Times and other political liberals than a Supreme Court with a majority of justices who are judicial conservatives. Having a Court that is evenly split between the two judicial philosophies might be acceptable, if only the swing voter would think like a judicial liberal 95 percent of the time. The present makeup of the Court is a problem for liberals for the simple reason that so much of what they want to do to the nation is disallowed by the plain language of the Constitution. Later, The Times frets: “Its members are not reluctant to strike down laws passed by Congress, as critics of ‘judicial activism’ are supposed to be, or reluctant to overturn the court’s precedents.” But once again there is a misunderstanding, or a deliberate misstatement. Judicial activism has to do with judges making law from the bench, not judges that over-rule bad laws. Is The Times implying that anything the Democrat-controlled Congress does should be okay? 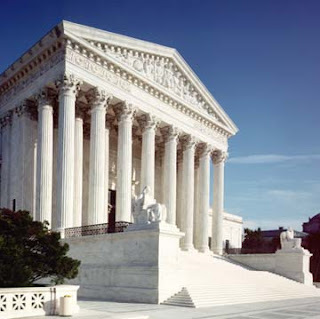 But you see, when the Supreme Court overrules a Congressional act, that is what the separation of powers concept is all about: the Court serves as a limit to the powers of the Legislative and the Executive Branches. And, of course, The Times couldn’t really blame the justices for reversing poor or improper legal precedents, could it? The newspaper criticizes President Bush for not admitting his mistakes, but criticizes the Court when it does. And then there is this: “The court’s 4-to-4 split means that, on virtually any controversial question, Justice Kennedy decides what American law is,” The Times laments. Well, yes, that is self-evident. When you have four people who read the Constitution strictly and four people who read it loosely, what would you imagine the ninth person would do? The only other options are to have a solid majority of one judicial temperament or the other, or have a majority of justices that, like Justice Kennedy, haven’t decided which philosophy they like better. One wonders just how The Times would propose to repair this situation. The Times editorial does nothing so well as it misinforms and spreads misunderstanding, and it makes villains out of four justices whose only wrong is reading the Constitution as it was written.